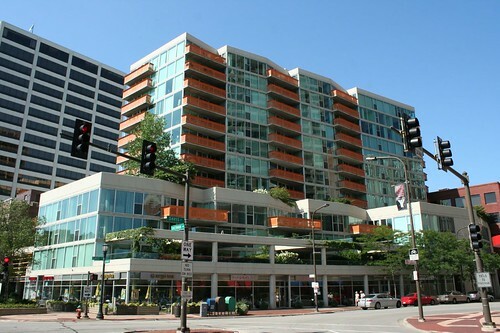 Evanston has had a trio of sophisticated, contemporary-styled condominiums go up in the last few years, all of them by the Optima design and development company, with architect David Hovey at the helm. They share a number of traits: a Modernist sensibility that is neither over-the-top nor inhumanely cool; a propensity for glass facades; and the ability to slot neatly into urban lots of virtually any size. 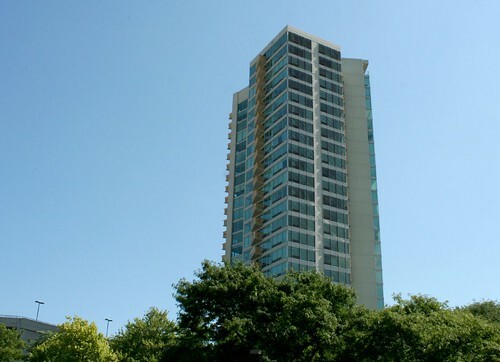 The best, or at least the most interesting for me, is the Optima Towers building. 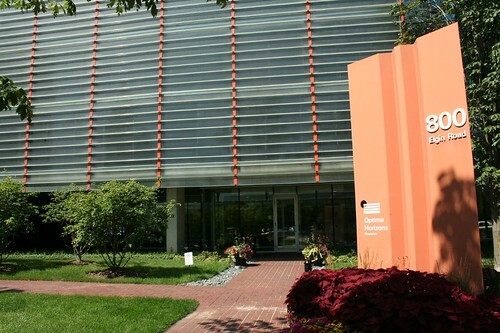 Undulating elevations of blue-tinted glass are broken up into a myriad of forms, with bright orange metal balcony railings further enlivening the view. The staggered profile alone is nice, but what really makes this building sing is the multiple layers of space around its base. 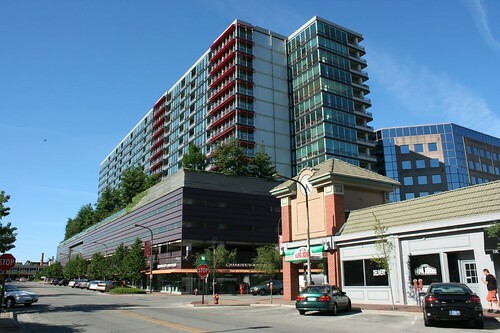 Two stories of balconies and dwelling units flare out over the street, hovering above a “wrapper” of stores. Indoor and outdoor spaces interweave, overlap, and all contribute their activity to the atmosphere of the street. This is a wonderful way to build up a street. In back of the building, the delightful complexity continues, as a narrow slot of space acts as a garden courtyard, with a waterwall fountain in the back. This serene space offers a layer of separation from the bustle of downtown Evanston. Ironically, despite its name, it’s the shortest of the three. 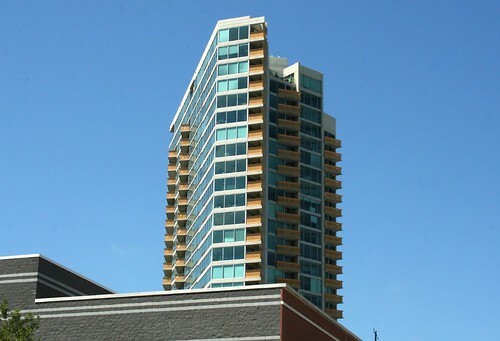 The connection between the Optima Views building and its smaller Towers cousin is obvious. 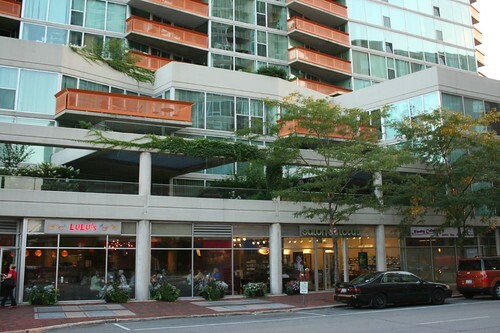 They use exactly the same orange-painted metal balconies, and share a similar aesthetic of carefully angled plans. 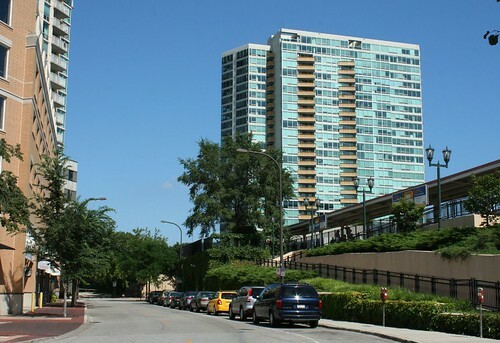 Optima Views is a much bigger and taller building, however. This broadside view of the south elevation is not the building’s best face. As you move around it, however, different views arise. The building changes shape completely, becoming a slender, jagged monument of glass and concrete. It was this view that made me wonder if Mr. Hovey was perhaps taking some inspiration from Frank Lloyd Wright’s Price Tower. Another point in common with Optima Towers: a slick ability to turn even the most neglected, leftover space into something pleasant and desirable, as with those shadowed corners that became intimate balconies. The entryway is more straightforward, given the much larger space available to work with. Optima Horizons is a Herculean block of glass and steel, an entire city block of dwellings lifted into the sky. The multiple levels of parking make its porches a bit detached from the city life about them, but it’s hard to argue with the notion of a mini-forest 4 stories up in the air. Like much about these buildings, it’s just plain cool. 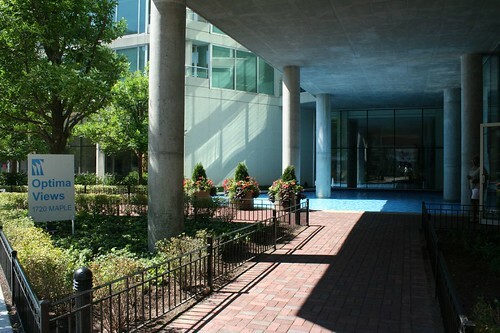 With the largest and most open site of the three, Optima Views also got the biggest entryway. 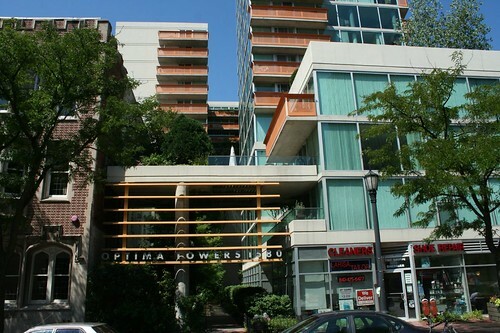 With so many condos and renovations adding clumsily tacked-on balconies, I have to comment on how much I like the way the Optima buildings handle their outdoor space. 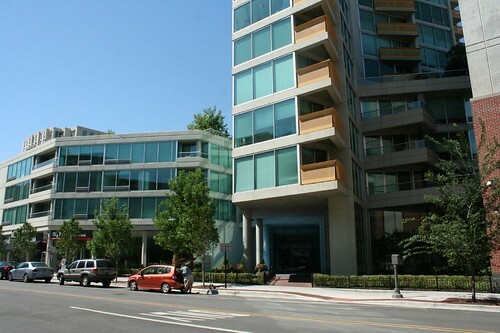 Even when the balconies protrude from the building, they never feel like separate, intrusive objects. Quite the contrary: the buildings’ compositions would be significantly diminished without them. 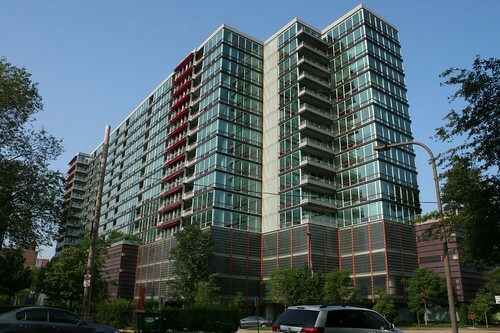 Coming up next time: Optima’s magnus opus in Skokie. I love the Towers lack of a parking pedestal, the variation on the first few levels is pretty spectacular.I'm a little less enthralled with the design of the pedestal on Horizons. I think with the absence of green in the winter it's going to look rather drab.Would love to see you revisit the buildings with snow on the ground, see what changes. Thanks for helping me appreciate these buildings a little more. My friends and I were in high school in the early 00s when they were being built, and we used to drive around critiquing them. We hated them all. 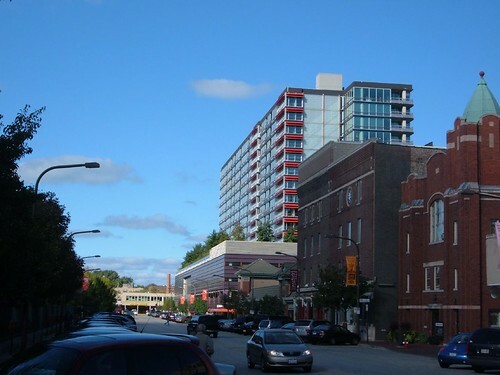 With so many popping up so close together, it seemed like Optima was dominating our downtown. They absolutely did not fit in with the character of old Evanston. We worried that her narrow streets were unsuited to accommodate the traffic sure to be generated by so many new residents. This was the very beginning of the wave of redevelopment downtown. The whole thing was very jarring.Now that it's been several years and additional development, the eye has grown accustomed to these buildings, and they are starting to sink into the city's identity. This structure shows our era’s penchant for the monotonous. This is boring “non-architecture” and, in my opinion is not worthy of praise.